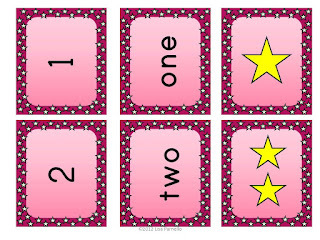 I'm finally working on centers activities for my new little kinder kids. I'm desperately trying to figure out how my reading time is going to work this year! I have kids learning ABC's, kids learning long vowels, and kids who can read small chapter books... all in the same room... at the same time... with no aide. I've decided centers activities are the only thing that will work to keep my tiny kinder kids on a task while I'm teaching something completely different to the older kids. I've found a ton of activities on Pinterest for easy-to-make centers. I can't wait to get in my classroom and get them ready. 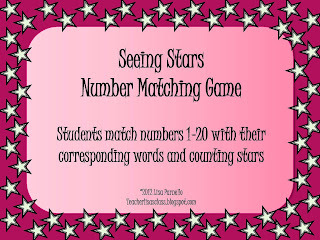 Last night I made a number matching game to go with my star theme this year. It's available in my TPT and Teacher's Notebook Stores just in time for the sale this weekend. Brand-new and already on sale! 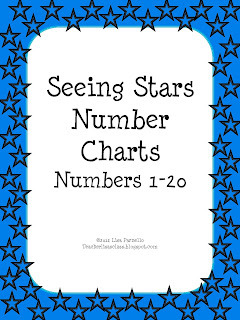 I also made a set of number charts for numbers 1-20. I figure I can use them for general math time, as well as a center. 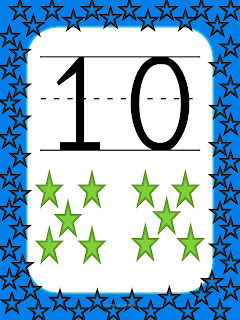 I already plan on doing a "Letter of the Day" and I'm thinking of doing a "Number of the Day" too. This will help me keep a theme for my centers each day. I'm all for less prep work and time spent thinking "what should I have them do this time??" Click the pics below if you'd like any of these for your classroom. One pic will take you to TPT, the other will take you to Teacher's Notebook. So choose your favorite. (HINT: Back to School Sale already started on Teacher's Notebook if you want to buy it Saturday before the TPT Sale).